The first partial solar eclipse 2011 is scheduled for January 4th, 2011, and will be seen in Europe, Africa and Central Asia. This eclipse will begin at 06:40:11 UT (Universal Time)) and culminates at 11:00:54 UT. 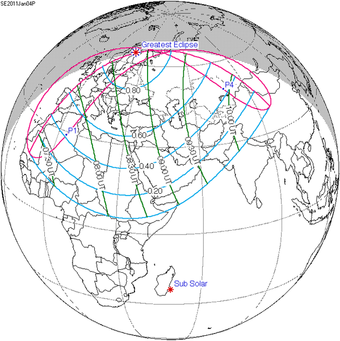 The greatest eclipse – the point of time when the distance between the Moon's shadow axis and Earth's center is the minimum – will happen at 08:50:35 UT over northern Sweden. If you live in northern Africa, the Middle East and Central Asia, you will be able to witness this eclipse. If you're planning on watching, remember eye safety and use a proper solar filter for telescopes and binoculars. If it's too late to get a filter or your budget won't allow, why not try building your own pinhole projector? Get two pieces of cardboard – one will need to be white or have white paper attached to it for the screen. Cut a small square in the other piece of cardboard, and tape aluminum foil over the square. Now make a pinhole in the middle of the foil. This is your "projector". With the Sun behind you, hold the pinhole projector as far away from the screen as you can. The farther away you are from the screen, the bigger your image will be. You won't be able to see fine details like sunspots, but you'll easily see the changes as the Moon passes over the face of the Sun! Don't be upset if you don't catch this eclipse. The next will happen on June 1, 2011 and be for the eastern region of Asia, northern region of North America and some islands of the North Atlantic. Again? How about July 1, 2011 and this time be over the Indian Ocean and the small islands in this ocean. Still not found you? Then how about November 25, 2011 and southern regions of Africa and Australia and whole of Antarctica! Want to watch the eclipses live? Then join the cast and crew at Bareket Observatory and at AstronomyLive.com! Image via NASA. This post originally appeared on Universe Today.